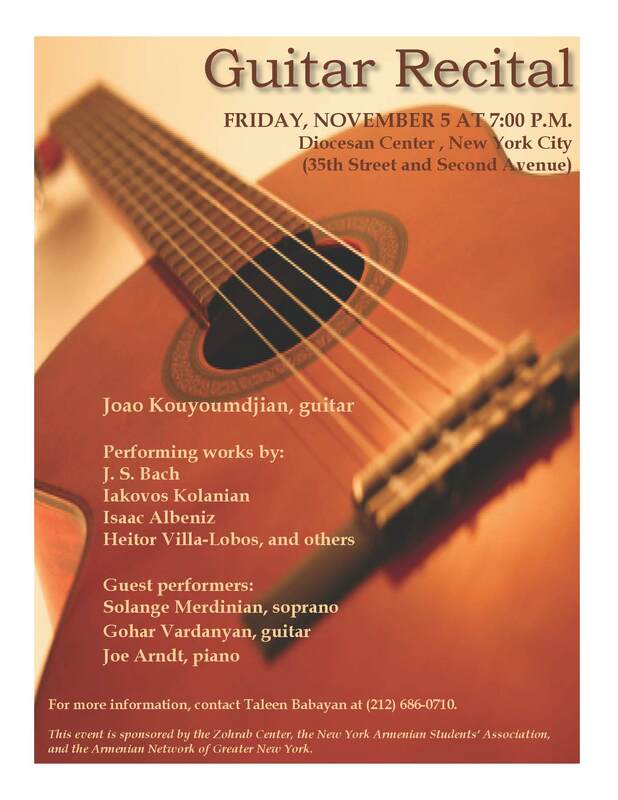 The Zohrab Center, New York Armenian Students’ Association and the Armenian Network of Greater New York will be hosting a guitar recital, featuring Joao Kouyumdjian, with guest performers Solange Merdinian (soprano), Gohar Vardanyan (guitar), and Joe Arndt (piano) on Friday, November 5 at 7 pm. This event will take place at the Diocesan Complex, located at 35th Street and 2nd Avenue, New York, NY. Pieces will be played by J.S. Bach, Iakovos Kolanian, Isaac Albeniz and others. This event is free and open to the public. A reception will follow the program. For more information, please contact Taleen Babayan at 212.686.0710.